Later today, an asteroid will pass within 202,000 miles of our planet. While scientists are confident the object, known as 2005 YU55, will not strike Earth, it is in astronomical terms a close call. Two Enslow books offer useful, engagingly written information about asteroids and other celestial rocks. One book -- Doomsday Rocks From Space -- is written with reluctant readers in mind. Author Margaret Poynter's 48-page, Guided Reading Level "T" title, part of the "Bizarre Science" series, investigates the science of doomsday rocks and the danger they pose to the planet. She also explores scientific theories that maintain that an asteroid collided with Earth during the Age of the Dinosaurs, effectively spelling the end of that era and many of its creatures. For students at Guided Reading Level "N," Enslow's Far-Out Guide to Asteroids and Comets offers a skillfully designed approach to the science and the intrigue of these phenomena. Author Mary Kay Carson's well-written book stimulates a reader's interest as well as does justice to the topic's science. This 48-page work, part of Enslow's twelve-title "Far-Out Guide to the Solar System" series, also includes a profile of a scientist, a timeline of exploration, and a collection of "Far-Out Facts" useful for reports. Books in the "Far-Out Guide to the Solar System" series and the "Bizarre Science" series are available in paperback and library-bound editions. Teacher's guides are available for all books in both series. Paperback prices are $7.95 per title; special six-pack rates are also available when you order directly from Enslow Publishers or from Enslow Classroom sales representatives. Library-bound editions are also available, starting from $17.95 per title (price reflects a 25% school/library discount from Enslow's list price). Hopefully the weather will be clear tonight so that you can do some watching. I hope you will see some! Have you ever seen a comet or a shooting star? You may think they look pretty, but these giant space rocks can cause major destruction. Scientists keep a close watch on comets and asteroids using high-powered telescopes and spacecraft. Get ready to learn lots of far-out facts about asteroids and comets! Check out Far-Out Guide to Asteroids and Comets, written by Mary Kay Carson for the upper elementary/lower middle school reader. It's available in both library and paperback! Ready for Astronomy Day on May 7? Astronomy Day is a grassroots movement designed to share astronomy with the general public. It is scheduled to occur on a Saturday between mid-April and mid-May at or just before the first quarter Moon. Enslow's new series, Far-Out Guide to the Solar System, is a great match for Astronomy Day. Geared toward upper elementary and middle school readers, and available in both library and paperback bindings, these 12 titles cover the different planets, as well as asteroids and comets, and the icy dwarf planets. A full lunar eclipse will take place throughout North America this evening. This phenomenon presents a wonderful teaching opportunity and potential "hands-on" experiences for students learning about astronomy. Help your students grasp the exciting science involved in an eclipse with Enslow books, including our new Far-Out Guide to the Moon. Author Mary Kay Carson's beautifully illustrated 48-page title uses a concise, interesting narrative and strong, reader-friendly design to introduce young readers to the science, myth, and mystery of the Moon. Book has a free, downloadable teacher's guide, including activities connected to various curricular areas. The book, part of the 12-book "Far-Out Guide to the Solar System" series, is available in paperback and library-bound editions. on this day in 1846, and yes, that was a long time ago, the planet Neptune was discovered by German astronomer Johann Gottfried Galle? There were actually three discoverers of Neptune. The first one, John Couch Adams, knew that because the path of Uranus around the Sun did not make sense (some years it had a faster rotation, other years slower), and so John Couch Adams told astronomers to start looking for an eighth planet. No one took him seriously, until Urbain J.J. Le Verrier did some math calculations and thought John Couch Adams was correct. Johann Gottfried Galle took these calculations to find the eighth planet. "The discoverers agreed to name the new planet after the Roman god Neptune." This quote was taken from page 9 of the book. Enslow's new title on this planet, for the elementary market, is available in both library and paperback bindings. Far-Out Guide to Asteroids and Comets, by Mary Kay Carson, has been published. 48 pages, full-color illustration, Enslow Publishers, Inc.
Earth is the only planet in our solar system that is suitable for life. It has liquid water, oxygen, and enough gravity to hold its own atmosphere. But did you know that Earth is always changing? Scientists have used spacecraft and satellites to learn more about our planet. They can better predict natural disasters like hurricanes, and monitor volcano eruptions and climate changes. Learn lots of far-out facts about our home planet. Far-Out Guide to Jupiter, by Mary Kay Carson, has been published. Jupiter is bigger than any other planet in our solar system. It has rings and centuries-old storms. It has more than sixty moons, too—some with underground oceans! Featuring a center spread with fast facts, this great addition to the Far Out Guide to the Solar System series will tell you everything you need to know about the biggest planet—including missions and the scientists who planned them, and the spacecraft they used to do so. Far-Out Guide to Mars, by Mary Kay Carson, has been published. 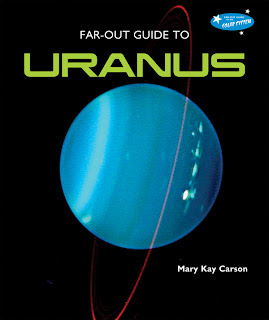 Far-Out Guide to Neptune, by Mary Kay Carson, has been published. All the facts you need, and lots more, are included in this up-to-date book. Learn about the amazing missions to Neptune, the dedicated scientists who plan them, and more far-out facts about the eighth planet from the Sun. Far-Out Guide to Saturn, by Mary Kay Carson, has been published. Saturn—the jewel of the solar system—has seven mysterious and beautiful rings. These rings, made of ice, dust, and rock, range in size from a snow crystals to a house. Learn about the amazing spacecraft missions to Saturn, the dedicated scientists who plan them, and more far-out facts about the sixth planet from the sun. Far-Out Guide to the Icy Dwarf Planets, by Mary Kay Carson, has been published. 48 pages, full-color illustrations, Enslow Publishers, Inc.
Far-Out Guide to the Moon, by Mary Kay Carson, has been published. Earth has many satellites, but the Moon is Earth's only natural satellite. Spacecraft and astronauts have visited the Moon to learn more about it. From the Apollo missions to the most current robotic spacecraft, this book highlights our adventures in studying our neighbor in space. 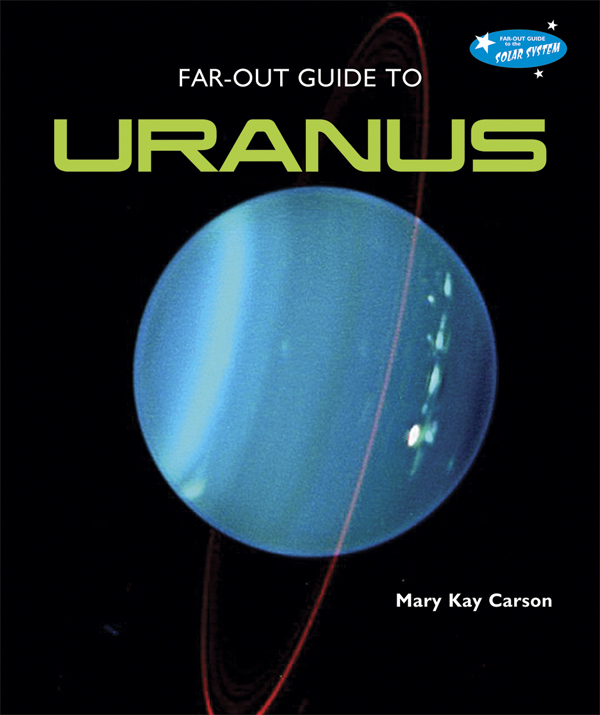 Far-Out Guide to Uranus, by Mary Kay Carson, has been published. How do scientists know anything about Uranus? Spacecraft from Earth have visited Uranus. Featuring a center spread with fast facts, this book highlights the missions, the men and women who plan them, and more far-out facts about the seventh planet from the sun. Far-Out Guide to Venus, by Mary Kay Carson, has been published. At a scorching 462 C, Venus is the hottest planet in the solar system—and poisonous clouds of gas surround it. Spacecraft from Earth have visited Venus. Learn about the amazing missions and the scientists who plan them This book features a center spread with fast facts, perfect for report writing. Far-Out Guide to Mercury, by Mary Kay Carson, has been published. Cratered Mercury is the smallest and fastest planet in the solar system. Temperatures there vary more than on any other planet. Learn lots of far-out facts about the closest planet to the Sun. This book features a center spread with fast facts, perfect for report writing. Far-Out Guide to the Sun, written by Mary Kay Carson, has been published. Everything in our solar system orbits the Sun. It is the center of our solar system, and affects everything in it. Robotic explorers have taught us a lot about the star at the center of our solar system. Learn about the amazing missions, the dedicated scientists who plan them, and more far-out facts about the Sun. All the facts you need, and lots more, are included in this up-to-date book. This is a time of year when families go outdoors in the evening, enjoy the cooler air, and take time to look at the night sky. This stargazing can be a fun, rewarding experience, as kids can indulge their curiosity about the Moon, planets, and stars above them. The activity encourages children to read about what they've been observing during these late summer evenings. Enslow Publishers' new "Far-Out Guide to the Solar System" provides an excellent, stimulating introduction to the elements that shape the night sky. The 12-title series encourages young readers to plunge into the world of astronomy, thanks to the books' superb, exciting design, excellent illustrations, and strong, accessible science. The series' editorial values also include age-appropriate text written by seasoned science writer Mary Kay Carson, with Guided Reading Levels ranging from M to N.